Located in Oak Park, Illinois and finished in 1908, the Unity Temple was commissioned by the Unitarian Universalist Church to replace their place of worship that had burned down a few years earlier. Designed by Frank Lloyd Wright it is considered one of his most significant buildings from his Prairie School period. Made out of exposed, cast concrete, Unity Temple has a similar monolithic appearance to ancient Greek and Egyptian temples. 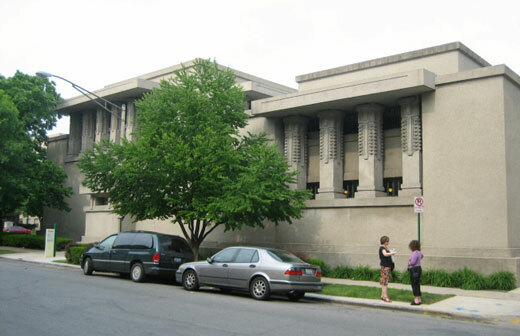 Egyptian temples in particular made use of clerestories, as Unity Temple does, to bring in natural lighting. 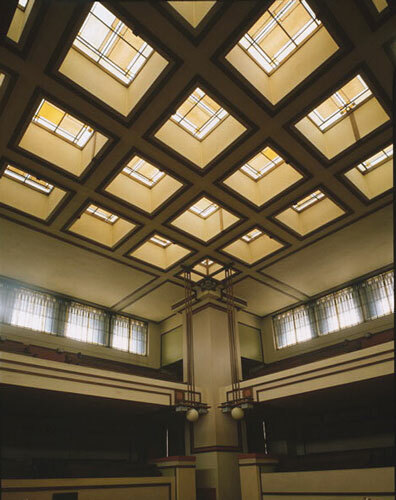 Wright once said that “the sun is the great luminary of all life.” This philosophy of Wright's is evident in the extensive use of natural lighting in the Unity Temple. Throughout history, natural light has represented the divine and eternal. Light is a provider for many essentials in life such as food, sight, and warmth. Through the use of natural lighting, the building allows man a space for worship and self-reflection to better understand the divine and eternal nature God. Unity Temple was one of the first buildings constructed entirely of poured-in-place, exposed concrete. Concrete was the perfect material for several reasons. First, the budget was relatively small and the concrete was a very cost-effective. Second, it gave the temple a timeless, dignified and monolithic appearance. Third, the concrete helped to acoustically isolate the sanctuary from the noisy adjacent street. The overall building massing is rather simple. 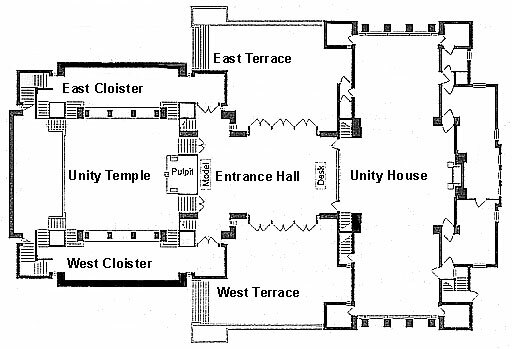 It consists of two large masses that enclose the sanctuary space (Unity Temple) on one end and the common space (Unity House) on the other. The two masses are in turn linked together by the Entrance Hall. The masses that form the Temple and the Unity House spaces are rather plain with solid massive walls. Visual interest comes from the projection of strong horizontal roofs supported by muscular columns that in turn screen deeply recessed windows. Once a visitor approaches and enters the Entrance Hall Wright carefully manipulates their spatial experience on their way to the sanctuary. The Entrance Hall is linked to the outside with the extensive use of stained glass windows and doors that Wright referred to as “light screens.” The visitor then turns to the left and enters one of two rather small, dark passageways that Wright referred to as the “Cloisters”. These spaces lead to the sanctuary and help to enhance the visual explosion of light and space as one enters the sanctuary. The sanctuary is filled with natural light, streaming through the clerestories and skylights above. Wright often used this spatial journey of compression and expansion to enhance the overall spatial experience of his buildings. To further complement his spatial decisions he typically developed a number of lighting strategies to enhance the emotional impact of his spaces. For instance, he used large eaves on the exterior to protect the interior from glare and to help diffuse the light from the clerestory windows. The clerestory windows then create a perimeter ring of light making the roof visually float above the lower walls. Equal attention was paid to the roof and skylights. The exterior features an outer glass roof that captures and directs the light to the interior stained glass ceiling. The stained glass in turn diffuses the light even more. Wright then chose warm, earthy tones for the stained glass to evoke feelings of nature and the outdoors. Although it may have been done partially for practical purposes, the lack of eye level glazing, coupled with natural light streaming in from above, offers the visitor the opportunity to be emotionally transported to the heavens and God above.